Tischlein deck 'dich. After all, nobody wants sauces, grease and other blots to land on the beautiful table. It is just as unfortunate if said culprit deface the tablecloth . Stubborn stains of wine, tomato sauce and Co. are difficult to remove from a tablecloth. Tablecloths are handy helpers when it comes to beautifying the table or protecting it from eager hands of children. With just a few simple steps the table is laid and festively decorated. But which tablecloth is suitable? While the EU has a DIN standard for just about everything, it lacks in washable tablecloths as well as a seal of quality that serves as a guide to consumers. In the washable tablecloths are offered in a variety of materials. The layman can not at first see what the difference is. The oilcloth will be familiar to everyone from the grandmother's table. It used to be used primarily as a tablecloth and for laying cabinets. Today's oilcloth has changed noticeably over the years. Not only the quality has improved over the years, also the designs and patterns. Today's oilcloths are usually made of PVC and a fleece back so they do not slip. Differences in quality are reflected in the price. Qualitative differences are to be noticed in the heaviness of the material as well as the back, which is shock-absorbing and slip-resistant. 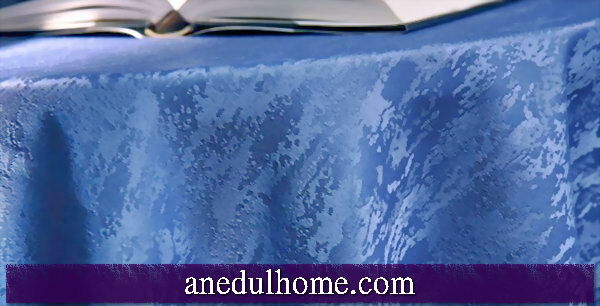 Another high-quality feature is the lowest possible gloss, which makes the tablecloth look less artificial. The benefits of the oilcloth tablecloth are clear: they can be wiped with a damp cloth and do not need to be washed , are decorative and resistant to any liquid and any food. In addition to ready-cut variants, the oilcloth is also available by the meter. Those who are interested can tailor this tablecloth to fit their own table. The modern oilcloth is not only suitable for the tablecloth in the dining room or the kitchen or for parties in the garden, but also in the nursery. With it, parents can cover their little ones' table so that they can and can carefree. There are also large quality differences in this area: Starting with light, cheap and flighty tablecloths which become worse after each wash, to tablecloths made of strong, heavy fabrics that are sealed. But even the heavy fabrics are not always an advantage: some coatings give the tablecloth a "plastic look" because it shines unnaturally. This is usually the case with polyester tablecloths. When buying is therefore important to ensure that the cotton content of the wipable tablecloth is as high as possible. Then the fabric and its structure can be seen better and the material looks higher quality. As mentioned before, there are no standards and quality labels for tablecloths. The coating and quality you can not see this product easily. Basically, there are several ways in which a fabric tablecloth can be sealed: For some products, the seal is not specified at all, for others it can at least be guessed. Unfortunately, the rumor circulates that water can not penetrate into sealed tablecloths. That's not right, in the nano-sealing, also called Lotus effect, liquids can penetrate into the tissue. The reason for this is that only the individual fibers are sealed, not the entire surface. By the way, : This wax system is based on Teflon or silicone and has nothing to do with the nano-technology itself. Acrylic Coatings are durable and survive any wash in of the washing machine. In practice, these tablecloths are rarely or not washed at all. The reason: The fabric is completely sealed and therefore no dirt can penetrate. For cleaning, it is sufficient to wash the tablecloth with a sponge and a small amount of detergent. The acrylic coating has another advantage: it protects the fabric from the sun's rays. It does not stay that fast, which is especially important for tablecloths that are used on the garden table. In terms of optics, there are great differences, as with the other types. The coatings have improved so much in recent years that you have to look very closely to even recognize them. Basically, however, sealed tablecloths are somewhat stiffer than untreated goods. Quality definitely has its price on washable tablecloths, but the investment is well worth it. Practical experience shows that high quality washable tablecloths remain in use for several years while their care is extremely easy. Online shops usually deliver good quality, whereas cheap models from discounters or similar stores usually do not even survive the first season.